I remember when I was growing up in elementary school, one of the two vegetables most hated by my peers (the other being lima beans) were brussels sprouts. Because of that, I never even tried a brussels sprout (or a lima bean for that matter) until much later in life, probably college. 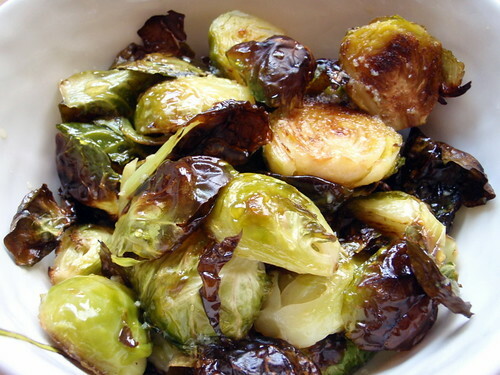 I do remember after trying my first brussels sprout thinking that they were absolutely delicious and so extremely cute, like a baby cabbage. I'm lucky enough to get to go to Manhattan for work every month or two but I'm too chicken to go downtown by myself since I usually stay uptown. So when a co-worker and fellow foodie joined me on my last trip, I told her in no uncertain terms that we were going to go to a Momofuku for dinner. I've been wanting to try the steamed pork buns forever! After a bit of research, I decided to go to the Momofuku Ssam Bar because the Momofuku Bakery and Milk Bar was just next door, and I also wanted to try the chess pie and cereal milk. I decided to skip the whole puffed rice bit so simplicity's sake. And while the mint in the original version added a very interesting note to the sauce, but I didn't really feel like buying some just for this recipe, and the same goes for the cilantro stems and Thai chiles. Plus, I still very much dislike cilantro. So I simplified the recipe even more by making the dressing with just the fish sauce, sugar, water, and garlic. Oh, and instead of roasting the sprouts in oil and then tossing them with butter, I just roasted them in duck fat because I had some on hand. And it's okay if the leaves start coming off of the sprouts when you're halving them. Throw them in along with everything else because they'll get really nice and crispy and totally be first thing you'll want to pop in your mouth when these come out of the oven. Preheat oven to 450°F with a rack in the upper third of the oven. 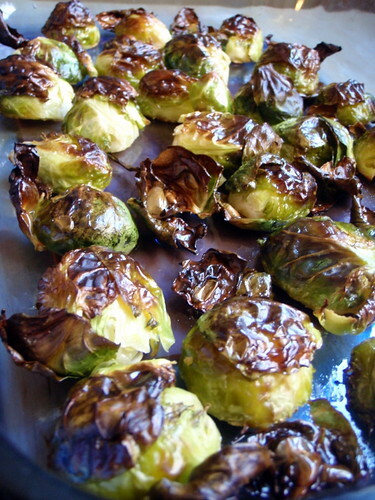 Trim and halve the Brussels sprouts, toss with oil, and roast, cut side down on baking sheet, for 20-35 minutes, depending on size and desired taste. They should brown but remain somewhat firm. Meanwhile, stir together the rest of the ingredients in a small bowl. Heat in the microwave for a minute to dissolve the sugar. When sprouts are done, transfer to a serving bowl and add just enough dressing to coat. That's it! You won't believe the depth of flavor you'll get from so few ingredients. They were so good I just kept eating them with my hands instead of taking the time to get a fork. The only downside to this is that the fish sauce can be quite stinky, especially if you're just smelling it and not eating any so you don't get the oral context for what your nose is telling you (kind of like how dumplings can be smelly if you're not the one eating them; a fact which I was unaware of for most of my life because I was usually the one eating them!). Honestly, I think I might have liked these better than the Momofuku version because the mint in the original kept jumping out and saying, "Here I am! I am mint!" And nobody likes to be interrupted when eating something this yummy. i've tried to experiment with duplicating this recipe at home too, funny enough. you just happened to have some duck fat? 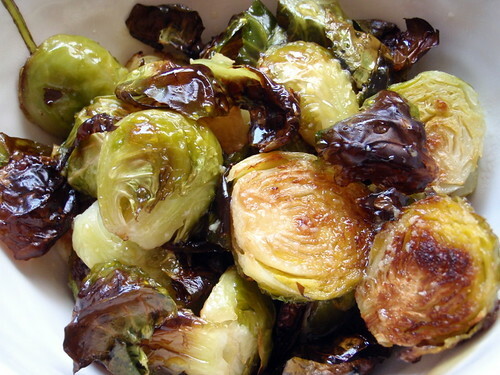 oh, and what's realy weird is that i LOVED Brussels sprouts even when i was a kid. Perfect timing--I just bought a bag of baby brussel sprouts! you know what's funny? i just bought some brussels sprouts too cuz i hate them. i may have to give this a try! Ambitious - Gah! Thanks for letting me know. My only excuse is that English isn't my first language, haha. I came to love 'em later in life, too. And now love them in an appetizer.